David may have come as a surprise to his parents, having joined the Shakers, a celibate society, the month he was conceived. They joined the 6th of March, 1806 and he was born the following December 12th. It is known from Shaker records, Francis Montfort Jr, did not want to join the Shakers at first, though his wife did. It may be that David was the result of "a last fling" between his parents. Perhaps the father wanted to dissuade her from joining the Shakers. David was born in Shelby County, Kentucky and considered a Shaker from his birth in December of 1806. He was a year old when his parents and siblings moved with his maternal grandparents, John and Polly Riker Banta, to Mercer County, KY and to the area near Pleasant HIll. It is possible he spent time in the same house as his mother and sister, but was most likely cared for by the other women in that house. As he matured, he attended school where he learned to read and write, and do math, but little else. His other education would be learning a trade from one of the Shaker men. Like his father, he was skilled as a carpenter and after leaving the Shakers would make his living in that occupation. As most of the young Shakers came of age in the 1820's, most made the decision to leave and go back to "the world." Davids brother would leave in March of 1827 and in June of the same year, David would follow. 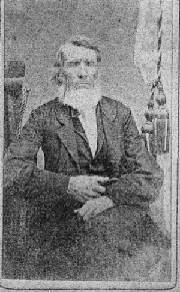 An entry in a journal of the Shakers shows that John left with the knowledge of the Shaker Elders and received 75 cents to help him get back to family in Shelby County. No such entry has been found for David or his sister, but it is more likely, they left the same way and with some money to help them along the way. They left their parents behind, as Polly did not die till July 1838 and Francis died January of 1867. Did they worry about their children going back to the world they had left in 1806? Did they miss seeing them? Did the children at some point, come back to visit their parents? Did they still have parental feelings for their children? There is no way of knowing, but I suspect they let their feelings pass with little thought. They were so immersed in their own lives as Shakers by this time and gave little thought to their children. David probably returned to the Shaker village in March of 1828 to get his sister, Charity. She had made her decision to leave the Shakers. Charity would live with David till her marriage to Isaac B. Fallis in the fall of 1828. Her only known child was a son named David Monfort Fallis and likely named for her brother. I suspect her husband was a friend of her brothers and may have gone with David to get Charity from Pleasant Hill. David is found in the 1830 Shelby County, Kentucky census, living alone. He would not marry till September 24, 1832 in Shelby County. His original license had been lost for a number of years, only an entry in a book of Shelby County marriages gave the datee. In 2002, the original document was found in a locked drawer in the Shelby County annex, tucked between the license of two other couples who married about the same time. Mary was the daughter of Seth and Frances Wilcoxson Cook, born about 1810 in Kentucky. She was one of 13 children of this pioneer family. Through her mother, she was a gt grandniece of Daniel Boone. Her great grandmother, Sarah Boone WIlcoxson, was the oldest sister of Daniel. In addition she was related through her mothers line to the Craigs and Faulkners, early Kentucky pioneers. Her grandfather, Lt Daniel WIlcoxson married Sallie Faulkner at Ft Boonesborugh in 1780, the ceremony probably performed by his Uncle Squire Boone, a Baptist preacher. Through the Faulkner line, she is related to John Craig and his brother, Elijah, who brought the Traveling Church to Kentucky in 1780. In VIrginia, the brothers had been arrested numerous times for practicing the Baptist faith. At that time, the colony was Church of England and no other faith was allowed. Patrick Henry spoke in their defense at one time. The uncles would go on to found Georgetown, Kentucky; Georgetown College, Carrolton, Kentucky; and be the first to distill bourbon in Kentucky, as well as ministering to their flock. Mary's grandmother, Rejoice/Joyce Craig Faulkner is known to have sent letters to her brothers about Kentucky, the land good for farming, no restrictions on practicing the Baptist faith, good hunting......but may have failed to mention the troubles with Indians and British. On her recommendations, the brothers appeared at a church meeting to tell their congregation their plans to move to Kentucky and invited others to join them. To their surprise, several hundred made the decision to follow them to Kentucky. Thus the name for this group of settlers, The Traveling Church. Polly Hawkins Craig, wife of Tolivar/Taliaferro, was the great grandmother of Mary Cook Montfort, and the mother of Joyce Craig Faukner. Of an old English family that can trace their ancestry to Elizabethan times, Polly would be noted as the heroine of Bryant Station. David and Mary would live in Lawrenceburg, Kentucky [Anderson County] for a number of years. They also spent some time in Shelby County and Ohio County, Kentucky before their deaths. They would have 6 children: James Francis , Lorinda/Laura , Israel Christopher , Martha Jane/Jennie , William Berry  and Nancy Elizabeth . David was a carpenter much of his life and apparently a talented one. Several of his grandsons would also be known as good carpenters as well. In later years, he and Mary would live in Lawrenceburg, Kentucky, near two of their daughters, Laura and Jennie. David died April 10, 1883 as recorded in a BIble belonging to daughter, Jennie, and buried in the Clayvillage Baptist Church Cemetery in Clayvillage, Shelby County, Kentucky. Mary Cook Montfort would survive him, dying on August 6, 1890 and buried next to him in the Clayvillage Baptist Church Cemetery. There are no markers to locate their graves, the only source of their interment is an old family Bible and a news clipping of the death of Mary Cook Montfort, which appeared in the Lawrenceburg, KY newspaper shortly after her death.